Just 2.2% of U.S. households both lack a car and live more than a mile from a supermarket, USDA estimated in a much anticipated report to Congress released today. An estimated 5.4% of households lack a car and live more than half a mile from a supermarket. Household surveys give similar estimates. About 5.7% of respondent households in the nationally representative Current Population Survey reported not always having enough food or the right kind of food, in connection with lack of food retail access. Low-income people are more likely than higher-income people to have close walking distance access to a supermarket. According to the Census Bureau data used by Michele Ver Ploeg and her colleagues at USDA's Economic Research Service, 29% of low-income people live within half a mile from a supermarket, while 22% of higher-income people live this close to a supermarket. The debate over supermarket deserts has been much on my mind in recent months (see also many posts under the food retail tag). The USDA results will be seen as out of step with the advocacy literature on supermarket deserts. I hope advocates for low-income people read the report with an open mind. The ERS report readily acknowledges the clear fact that, in particular locations, such as some devastated urban cores and some poor rural areas, lack of retail access is significant. Yet, for a variety of reasons, I have been worrying that the way this issue had been framed as a national concern has been muddied by incorrect assumptions and generalizations. The data-heavy USDA report offers an important opportunity for clarifying the food retail agenda. To understand how the estimates in the USDA report could differ from one's prior expectations, it helps to look closely at the maps. 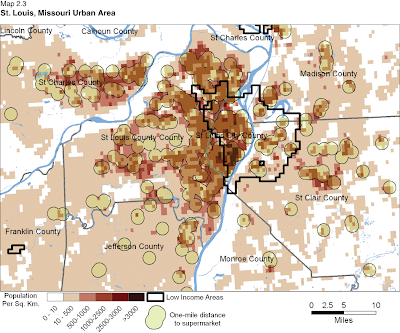 Take East Saint Louis (below) or Washington (see report), for example. One can find very poor neighborhoods without supermarket access, but they are not where most people -- even most poor people -- live. Most densely populated neighborhoods, including densely populated poor neighborhoods, can boast a supermarket. The important policy issue at stake here is a choice over the proper remedy for supermarket deserts. I think that government incentives to attract supermarkets may be good policy in rare and limited retail situations. Efforts to improve fresh fruit and vegetable marketing make sense in a wider variety of low-income neighborhoods. In many cases, the best policy is to think of food retail improvement as one component of a longer-term neighborhood anti-poverty agenda, rather than something that can be typically achieved with tax breaks to supermarkets. I imagine this report may generate some discussion, so I'll save more thoughts for the comments. Update: Ezra Klein discusses this report. The 9th Circuit Court of Appeals has ruled that the planting of GE alfalfa can cause potentially irreversible harm to organic and conventional crops. Monsanto’s petition to rehear was denied in full. Today’s decision again upholds District Court Judge Charles Breyer’s earlier ruling of May 2007, in which he found that the USDA failed to address concerns that Roundup Ready alfalfa will contaminate conventional and organic alfalfa. The Ninth Circuit decision affirms that USDA violated national environmental laws by approving GE alfalfa without a full Environmental Impact Statement. You can read the 9th Circuit Court of Appeals publication here (.pdf). Enjoyed your review, but took Food, Inc. more favorably on several key points. It’s not surprising that you have trouble distinguishing the real merits behind the save-the-world green marketing of Coke, Pepsi, Cheerios, and Post. The movie did well to raise questions about even the most green brands like Stonyfield. The real contrast it draws is between conventional and local and organic food. I understand the question about whether the world can produce enough food, but I have a pair of standards for those who raise this concern: (a) Did they acknowledge that advanced non-GMO technologies are immensely productive and that GMOs make only a modest further improvement?, and (b) did they discuss the inefficiency of historically unprecedented per capita grain-fed meat and dairy in the same paragraph as their concern about non-GMO technology? Without these points, the repeated mantra “But how can we feed the world” risks misdirection. Robert Kenner's new documentary, Food, Inc., hits hard by picking its fights carefully. It could have criticized biotechnology broadly, winning a mix of agreement and disagreement from scientists, activists, and farmers in the audience. Instead, the movie nails its indictment of Monsanto's lawsuits against farmers and local seed processors. It skewers the patent laws that give a chemical company control of 90% of the U.S. soybean crop. "Monsanto did not agree to be interviewed." Whether scientist, activist, or farmer, pretty much everybody in the audience has to be outraged. It could have promoted a vegetarian or animal rights case against modern meat production, again winning a mix of agreement and disagreement from a diverse audience. 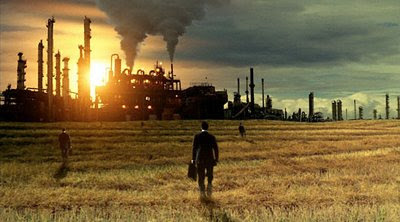 Instead, the movie tears into the economic abuse of contract farmers and slaughterhouse workers, while letting the powerful visuals of a high-tech poultry factory, a beef slaughterhouse, and industrial chicken farming operations deliver any additional lessons that the viewer wants to entertain and receive. "Smithfield did not agree to be interviewed." Whether low-wage worker or high-income gourmet, farmer or city person, anybody in the audience is compelled to at least acknowledge the filmmaker's viewpoint. It could have sounded the alarm about any number of food safety concerns, some of which divide public health officials from the good food movement believers. Instead, it chose microbial contamination in meat, an issue that is entirely mainstream. The story of two-year-old Kevin Kowalcyk, who died from eating a hamburger, leaves the audience with little room for computations of nontrivial risk levels that we should just accept without complaint in the name of economic efficiency and low meat prices. A running theme discussed how different sectors of the food industry try to keep information from consumers. "Tyson refused to be interviewed." The third or fourth such refusal finally generated a chuckle from the audience. A clip of an industry official trying lamely to explain why cloned meat could not be labeled, because consumers cannot be trusted to interpret this information favorably, is infuriating. In a Twitter conversation yesterday, before I saw the film last night, Kenner suggested the politics of information as a key focus for a viewer. @usfoodpolicy: Looking forward to #foodinc tonight in MA. What scene will be most surprising to a farmer in the audience? nutrition prof? ag economist? That would be my recommendation to you also, as you see the film. Is it true, as some of the ag folks in the Twitter conversation claimed, that consumers are willfully or foolishly ignorant of the facts of food production? Or, are the consumers sovereign, here, while the food industry is trying to keep them in the dark about what is really going on in the kingdom? The film is highly indebted to participants Michael Pollan, Eric Schlosser, Joel Salatin and a number of people who have written about the biotechnology industry. If you have already read those writers, don't expect new information, but you may enjoy the film anyway. Update: I enjoyed Nicholas Kristof's review and blog post. According to this Pollo Loco ad, this is genuine audio of KFC executives trying and failing to prank call a Pollo Loco telephone line. I saw this on the Daily Bread food business blog. The fun blog Obama Foodorama covers a mix of celebrity and serious news at the intersection between the Obama White House and food. A post on the political implications of soft drink critic Thomas Frieden's appointment to the Centers for Disease Control is followed by a post about Michelle Obama's photo events in the new White House organic garden or about running into Demi Moore or Padma Lakshmi at a White House event. Obama Foodorama blogger Eddie Gehman Kohan and I were both quoted this morning in a Politico article by Erika Lovley, who discussed the Obamas' challenge in providing leadership by example without seeming fussy or elitist about food. The income cutoffs and benefit formula for the SNAP (food stamp) program are not as crazy as you sometimes read. The AP's Matt Apuzzo today tells the sad story of Georgia resident Mark Milota, whose $25 increase in monthly unemployment benefits put him over the income cutoff for the SNAP program (food stamp benefits). The Georgia Department of Human Resources explained in a letter to him last month that, because of the stimulus, he was ineligible for food stamps. He now makes $1,538 a month — $21 too much for a family of two to qualify. "We have to pay him that $25 a week," said Brenda Brown, assistant commissioner at the Georgia Department of Labor. "And he doesn't have the option not to accept it." Milota said he was told that, without the stimulus money, he would have received about $300 a month in food stamps. The REAL problem here is that government programs like food stamps have "hard cutoffs". Instead, they should have "graduated reduction". The way this can work is that for every $3 over a certain amount, the program benefit is reduced by $1. If this were applied to Mark Milota's case, then for being over the level by $21, his food stamps would be reduced by only $7. The funny thing is that this is how the SNAP benefit formula already works. The poorest participants get the maximum benefit. People close to the income cutoff generally get a smaller benefit. The story about Mr. Milota seems odd. I wonder if Mr. Apuzzo got the details wrong or quoted Mr. Milota overstating the situation. The income cutoff for a family of two is indeed $1517, so if Mr. Milota started with $1513 monthly, it makes sense that his extra $25 monthly would make him ineligible. But, I have trouble seeing how he could have lost $300 monthly in food stamp benefits in this situation. The eligibility rules give Mr. Milota a maximum monthly benefit ($367 monthly) minus 30% of his net income after deductions. The deductions, subtracted from his income, include a standard deduction ($144), an excess shelter deduction (probably a couple hundred dollars and at most about $400, I think), and some other deductions that are typically smaller. Unless his is a very unusual case, with much higher deductions than that, he had several hundred dollars in net income. I would be surprised if the $25 in new unemployment benefits caused a net loss for Mr. Milota. If he did have a net loss, I'd be still more surprised if it were $300. It seems more likely that somebody looked up and misunderstood the rules, thinking that Mr. Milota would be eligible for the maximum benefit despite having monthly income substantially greater than the federal poverty standard. I don't think that yet more complex stimulus package legislation, anticipating every obscure boundary case in food stamp eligibility rules, would have been wise policy making. The "government gone bad" story line seems misplaced here. Thanks to Jack at Fork & Bottle for pointing me toward this story. Update (6/23/2009): Corroborating the gist of this post, the Center on Budget and Policy Priorities estimates that only perhaps 1/3 of 1% of unemployment insurance recipients might have been disadvantaged by the stimulus benefits. 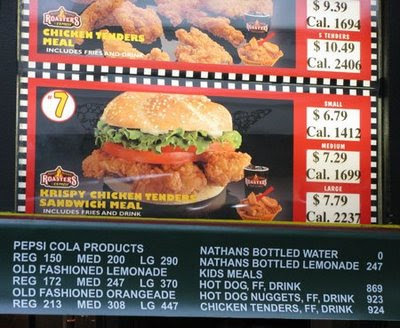 The National Restaurant Association today announced support for national calorie labeling in chain restaurants. The proposed legislation (.pdf), the Labeling Education and Nutrition Act of 2008 (LEAN Act), "will provide a national nutrition labeling standard for foodservice establishments with 20 or more locations." The Center for Science in the Public Interest, a public interest group that has long supported restaurant nutrition labeling, joined with the restaurant trade association in supporting the bill. CSPI director Michael Jacobson has a related blog post at the Huffington Post. Why would the restaurant industry, which has in the past strongly opposed such policies, now lend its support? There are several reasons. First, the bill is a compromise bill, providing the restaurant chains with some of their key policy priorities, including preserving a good deal of flexibility in deciding how to present the information and protection from what the restaurants describe as "frivolous" lawsuits. Second, the industry is facing the hard facts that menu labeling policies are succeeding at the state and local level around the country. As with other important nutrition labeling policies in the past, such as the current nutrition facts panel on packaged food, an important sector of the food industry chose to support a new government policy in return for more consistent and less burdensome regulation across jurisdictions. The drastic drop in milk prices paid to farmers over the past year has led to an unprecedented crisis for dairy farmers who, on average, are being paid less than half the cost of production. Low prices and high production costs threaten to push nearly one-third of dairy farmers off their land over the next couple of months, strengthening corporate control of the dairy industry and severely impacting the health of local and regional economies nationwide. Dairy farmers have been hit with a catastrophic combination of factors beyond their control. Farmers are struggling to pay bills from record high feed and fuel costs; adequate credit is increasingly impossible to come by; and the price of milk paid to farmers by processors collapsed a record 30 percent in January alone, and is currently down 50 percent since July 2008. In the meantime, the top dairy processors have recently announced 2009 first quarter earnings that are up from the same period last year. The top processor, Dean Foods, reported their first quarter earnings are more than double that of last year thanks in part to the plunging price Dean pays to its milk producers. Under Section 608c (18) of the Agricultural Marketing Agreement Act of 1937, the Secretary of Agriculture is required to adjust the price of milk paid to farmers to “reflect the price of feeds, the available supplies of feeds, and other economic conditions which affect market supply and demand for milk and its products.” Farm Aid urges Secretary Vilsack to use this power to immediately institute a set price for milk that reflects the cost of production, keeping dairy farmers on their land. Following Parke's lead, I would like to disclose that I am (proud to be) interning at Farm Aid. Cross posted from Epicurean Ideal. I love this artist Joe Wirtheim and posted about his 2008 Collection of New Age Victory Garden posters back in February. 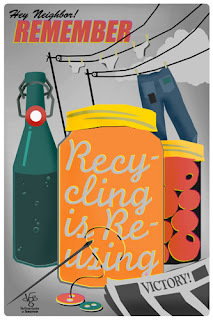 Joe combines two things I love: art and propaganda to propel my favorite cause: independence through sustainability! His new 2009 Collection promotes planting and growing organic food, remembering that reducing and reusing come BEFORE curb recycling, and the importance of protecting and contributing to our forests and trees for the sinking of carbon. I think they make awesome kitchen or office art. You can buy them at the ETSY store, an online artisan bizarre where you can support other people in their artistic skill and sport one of a kind items. An interest in raw food diets is sprouting up across the country (pun intended). Raw milk and almonds have been a topic of debate for regulators on the basis of food safety and freedom of choice on the part of 'raw foodists'. My interest in raw foods began in college and is fueled by health conscious friends that have embraced the diet. My recent review of Dr. Colin Campbell's China Study has me reexamining cultural diets. The raw food diet is based on the principle that the cooking process strips vital nutrients from natural foods and that eating your food raw not only retains all the minerals and nutrients of fresh foods, but it makes it easier to digest and can help detoxify your system. According to Cathy Wong at AltMedicine, the diet typically consists of unprocessed, preferably organic, whole foods such as: fresh fruits and vegetables, nuts, seeds, beans, grains, legumes, dried fruit, seaweed, unprocessed organic or natural foods, freshly juiced fruit and vegetables, purified water, and young coconut milk. At least 75% of food consumed should not be heated over 116 degrees F.
Specific preparation techniques aimed at making food more digestible and to add variety are: sprouting seeds, grains, and beans, juicing fruit and vegetables, soaking nuts and dried fruit, blending, and dehydrating food. Raw foodists have kitchen equipment consisting of a food dehydrator in place the microwave, a juicer, a blender or food processor, and seed sprouting containers. Critics of the diet warn of nutrient deficiencies, specifically in calcium, iron, B12, protein and calories. They also say that the body produces the enzymes it needs to digest foods. Harvard anthropologist Richard Wrangham recently released his provocative new book, CATCHING FIRE: How Cooking Made Us Human, which was recently reviewed by the New York Times. The premise of the raw food diet is to cook foods below 160 degrees Fahrenheit to keep food enzymes intact so that the body can better absorb nutrients in the food. The problem with this theory is that the body already makes the enzymes needed to digest and absorb foods. The raw foods diet encourages you to eat fresh fruits and vegetables, which is a definite nutritional plus. But there are real food safety risks. The diet calls for eating a variety of sprouts, many of which grow in environments that can promote harmful bacterial growth. And cooking foods below 160 degrees Fahrenheit can lead to foodborne illness. As with any diet, when evaluating the “raw foods” approach, ask questions. If you think “This sounds too good to be true,” it probably is. The diet contains fewer trans fats and saturated fat than the typical Western diet. It is also low in sodium and high in potassium, magnesium, folate, fiber and health-promoting plant chemicals called phytochemicals. Sin-Free Apple 3.14- A fresh and crisp apple pie with a cashew and brasil nut crust and topped with macademia sauce. Our guide and owner Igor Rakuz fed us a ton of raw chocolate made in house with raw cocao butter, coconut oil, maca, and agave nectar. We sipped on Kava tea, known for its ability to promote relaxation, and talked about his vision for the restaurant which has come to be a community epicenter based on food sovereignty and health. The days following city council members were meeting to discuss the removal of fluoride from the city's water. The restaurant also impressed me in the sustainability methods. 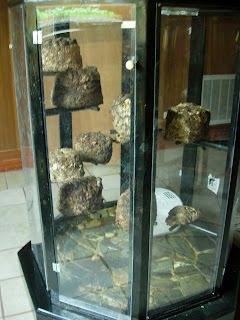 The back room was sprouting much of its own food and an in house humidifier where they grew their own mushrooms. They were also composting, recycling, reusing and reducing their impact in a variety of ways. They only use local spring water that the employees fetch daily. The restaurant was donned with literature and books for customers to educate themselves on wondrous super foods as they waited for the friendly crew to loving prepare their meal. On the wall was the quote: "Food Sovereignty: the ability of any group of people to define, create and distribute their food and water independently." One of the main concerns for advocates against Genetically Modified (GM) crops is the growing number of pesticide tolerant or resistant weeds and their affect on crop yield. According to an article published in Geoforum by Binimelis et al, in 2009 a glyphosate-resistant biotype of johnsongrass (Sorghum halepense (L.)) appeared in Argentina and now covers at least 10,000 ha. They explain that no preventive strategies are deployed against the invasion. The reactive measures are based on "gene-stacking" that allows the use of still more glyphosate or new combinations of herbicides. A new phenomenon called the "transgenic treadmill" is identified. A colleague of mine pointed out that since the EU is the largest importer of soybeans, European awareness of the local impacts of imported soybeans (as feedstuffs and/or agro-fuels) should not focus only on deforestation, but also consider the socio-environmental consequences apart from the loss of productivity. Bonnie Azab Powell at the Ethicurean recently posted “The Failure of Science”: New paper makes a damning case against genetically modified food crops" where she mentions the new book “Intervention: Confronting the Real Risks of Genetic Engineering and Life on a Biotech Planet" by technology reporter Denise Caruso and recent articles published in the International Journal of Society of Agriculture and Food. The two part series Part 1: The Development of a Flawed Enterprise and Part 2: Academic Capitalism and the Loss of Scientific Integrity highlight the conflict between science and society through a historical perspective, tactics used, and regulatory flaws and failures. This year's Global Food Security Act of 2009 introduced by Senator Richard Lugar, "would authorize appropriations for fiscal years 2010 through 2014 to provide assistance to foreign countries to promote food security, to stimulate rural economies, and to improve emergency response to food crises, to amend the Foreign Assistance Act(FAA) of 1961." Sounds like a great bill for the US to help alleviate world hunger except that it creatively amends the FAA of 1961 by makinging the first sentence include "research on biotechnological advances appropriate to local ecological conditions, including genetically modified technology." Consequently, the bill specifies that the U.S. MUST fund GMOs and biotechnology, a change in policy up to this point. The bill was nicknamed "the REAL Monsanto bill" by the Organic Consumers Association. According to Monsanto's first quarter lobbying reports, the company spent $2,094,000 in the first quarter 2009. Their specific lobbying issues were Biotechnology acceptance, S. 384- Global Food Security Act of 2009, Sustainable Yield Initiative, Crop insurance/Biotech yield endorsement and USDA Rulemaking - 7CFR Part 340. (thanks to La Vida Locavore who was contacted by Monsanto who denied involvement in the bill). In the waning months of the Bush Administration, the U.S. Department of Agriculture (USDA) released a proposal to completely overhaul its regulation of genetically engineered crops, significantly weakening its oversight. USDA also published the rules before publishing the full Environmental Impact Statement (EIS), as required by law, and in the absence of public review of the data needed to make regulatory recommendations. A comment period for USDA's Docket No. APHIS-2008-0023, Importation, Interstate Movement, and Release into the Environment of Certain Genetically Engineered Organisms has been extended until June 29th. If you wish to submit a comment using the Internet, go to the Federal eRulemaking portal. Then click on “Add Comments.” This will also allow you to view public comments and related materials available electronically. Using the Federal eRulemaking portal is the best way to ensure that your comments will be associated with the right docket and reviewed by the right people. Consideration will be given to all comments received on or before June 29th. 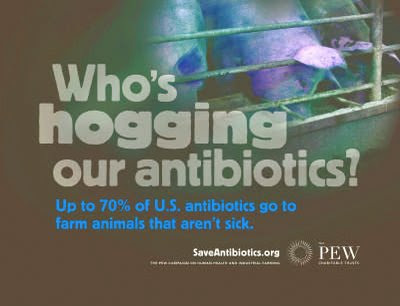 Up to 70 percent of U.S. antibiotics go to farm animals that aren't sick, to offset overcrowding and poor sanitation. This practice promotes the development of deadly strains of drug-resistant bacteria that can spread to humans. Consumers are exposed to resistant bacteria through the handling and consumption of contaminated meat, through produce that has been exposed to resistant bacteria in soil and water, or even through direct contact with the bacteria in the environment. Antibiotic-resistant infections cost the U.S. health care system at least $4 to $5 billion per year. One reason is the misuse of antibiotics on factory farms, which promotes the development of drug-resistant diseases. Each year 325,000 hospitalizations and 5,000 deaths occur due to people eating food contaminated by dangerous pathogens and bacteria such as Salmonella and E. Coli, which are often antibiotic resistant. Noticed on the Beyond Green blog. I have a simple test for sniffing out my least favorite kind of food and nutrition journalism. Try to discern if it carries an implicit message that "everything you thought was bad for you is good for you again sooner or later." Good nutrition advice is fairly stable, with a modest drift noticeable from half-decade to half-decade, not week to week. Pollan's version: "Eat food. Mostly plants. Not too much." The federal government's Dietary Guidelines for Americans, though more heavy on nutritionism, basically agree. They are adjusted a bit every five years, and some say the revisions should be once per decade. Regina Schrambling's article on Slate yesterday saves us the trouble of looking for the implicit message. The first sentence is: "Wait long enough and everything bad for you is good again." The article whitewashes . . . lard. Time permits just the briefest summary of the nutrition evaluation: fine in very small quantities, bad for health and the environment in large quantities, and in all cases not deserving of a whitewash. Where did I see this theme just recently? Oh, yes, it was the blog post titled "lard is good" by Shauna James Ahern -- the gluten-free girl -- who has disappointed her fans by blogging now with sponsorship by . . . the National Pork Board, the semi-public board that uses the federal government's powers of taxation to collect mandatory assessments for promoting pork. Update: Edited just slightly for milder tone. A question (not just an answer): How much does a nutritious diet cost? Some say that the high price of healthy food is making us obese and unhealthy. Others wonder how that could be so, because (even with recent inflation) food of all sorts has been comparatively cheap in the United States for many years, due to government policy and technological change in the food system. whether you think low-income people can cook at home, or whether instead convenience and restaurant foods are central to your definition of adequacy. More subtly, your estimate of minimal cost depends on your opinion about whether people can change their diets in order to meet cost and nutrition goals, or whether it is inevitable that any realistic diet closely resembles the current average diet. Reasonable answers about the cost of a nutritious diet, corresponding to different definitions of nutritious, range from even less expensive than the federal government's Thrifty Food Plan to much more expensive. No wonder this issue generates a lot of argument! Most people on all sides of this issue leave these key assumptions implicit and unstated. Yet, these assumptions strongly influence conclusions about minimal costs. In a recent article in the Journal of Consumer Affairs (free abstract, pay site for full article), "Using the Thrifty Food Plan to Assess the Cost of a Nutritious Diet," Joseph Llobrera and I use USDA's Thrifty Food Plan (TFP) framework to clarify the relationship between assumptions and cost estimates for nutritious diets. Let me know by email if your library does not have the journal. There is a related seminar on the Friedman School website. If you would like to play around with these models yourself, see our Thrifty Food Plan calculator. In both the seminar and the calculator, I should have emphasized more strongly that all of the dollars are in 2001 dollars per adult in the household, not adjusted for inflation (if you didn't know this, the amounts would seem unrealistically low). For some readers, the whole computation will seem beside the point. They may reason that is clearly wrong to set the TFP cost target too low, but harmless to set it too high, so why not just pick the highest estimate? For a number of reasons, I think better food assistance policy comes from trying to choose the right estimate for a minimal cost target, rather than padding the estimate too much. 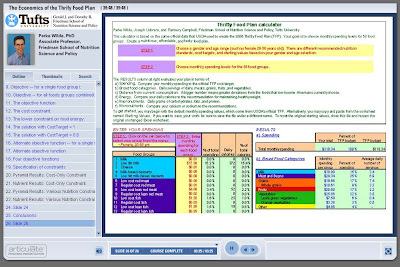 In the article, we find that the USDA's Thrifty Food Plan cost level can purchase a nutritious diet if (1) you think nutrient constraints (adequate protein, for example) are more important than food category constraints (plenty of meat), or (2) if you think it is reasonable to expect people to drastically change their current consumption pattern. If, instead, you think substantial meat and dairy amounts are essential to an adequate diet and you defer to the current consumption pattern of low-income consumers, you will probably prefer a more generous TFP cost target. Update: Slate's Daily Bread food business blog has a thoughtful post about this article (gently needling the online presentation as "a little geeky" -- ha! ).